A recent New England Journal of Medicine study indicates that the number of Americans without health insurance has declined significantly since the Affordable Care Act (ACA) open-enrollment period began in October 2013. The pattern of coverage changes were consistent with the eligibility criteria in the ACA regarding subsidized coverage and US Department of Health and Human Services (HHS) statistics on state-level enrollment in ACA programs. National estimates of coverage after the open-enrollment period will not be available from federal surveys until late 2014, and reliable state-level estimates will not be available until the fall of 2015. The report concludes that future research with government-conducted surveys will be valuable to corroborate these findings, monitor future trends and further assess the downstream effects of coverage. The Obama Administration is moving forward to implement the Affordable Care Act (ACA) employer mandate that has been delayed twice and is the centerpiece of the House’s lawsuit against President Obama. To obtain a copy of the IRS form go to http://www.irs.gov/pub/irs-dft/f1095c--dft.pdf. As you’ve read in the press, two federal courts have issued directly conflicting decisions on the same day (July 22nd) on the availability of subsidies for health insurance purchased by individuals on exchanges established by the federal government under the Affordable Care Act (ACA). A three-member panel of the DC Circuit Court of Appeals has held that the subsidy is only available for insurance purchased on a state exchange (versus a federal exchange); invalidating the Internal Revenue Service (IRS) regulation that authorizes the subsidy for insurance purchased on a federal exchange (Halbig v Burwell). Shortly thereafter (within hours), a three-member panel of the Fourth Circuit Court of Appeals reached the opposite conclusion, and held that subsidies are available to all individuals who purchase insurance from the federal government, regardless of whether or not those exchanges were established by the federal government (as in most states) or by an individual state. (King v Burwell). If it is eventually determined that the IRS regulation is invalid and subsidies are not available on exchanges established by the federal government, then one leg of the government’s “three-legged stool” in the ACA is removed in more than ½ the states (with federal exchanges) in the US (recall the solutions enacted in the ACA are often referred to as the “three legged stool” of health care and consists of 1) guarantee of insurance; 2) mandate of insurance; and 3) subsidies so that those who can’t afford insurance can get help). AHCA/NCAL will keep you informed as we follow this important litigation through the judicial process. The observation stays issue remains at the forefront before Congress breaks for August recess. The U.S. Senate Special Committee on Aging is holding a hearing today entitled, Admitted or Not? The Impact of Medicare Observation Status on Seniors. Committee Chairman Bill Nelson (D-FL) and Ranking Member Susan Collins (R-ME) will be leading the hearing at 2:00 pm ET in Senate Russell 418, focusing on the observation stays issue. Witnesses will include AHCA/NCAL member Bob Armstrong, Vice President, Elder Care Services, St. Mary’s Health System, Lewiston, Maine. For the witness list, check the website for the Senate Special Committee on Aging. In addition to the hearing today, earlier this week, Congressmen Lloyd Doggett (D-TX-35) and Todd Young (R-IN-9) introduced the Notice of Observation Treatment and Implication for Care Eligibility Act H.R. 5232, also called the NOTICE Act. The legislation requires hospitals to give formal notice to patients within a period of time after classifying them as an inpatient or as an outpatient under observation. The bill is a positive step forward, and raises attention to a complex and critical issue hurting the nation’s seniors. Specifically, the NOTICE Act works to ensure that hospitals notify patients entitled to Medicare part A coverage of their outpatient status within 36 hours after the time of their classification or, if sooner, upon discharge. Often times, patients have no idea what their status is in a hospital or the importance of it. This can lead to thousands of dollars in out-of-pocket medical expenses should they need skilled nursing center care following their hospital stay. The observation stays issue is a financial burden on seniors and their families. It can cause unnecessary spend-down, accelerating the time frame in which seniors will have to turn to programs such as Medicaid to pay for their care. Although the NOTICE Act is an important step in ensuring that beneficiaries understand what is happening to them, the American Health Care Association/National Center for Assisted Living (AHCA/NCAL) and other provider and beneficiary groups continues to advocate for legislation that would address the observation stays issue once and for all. AHCA/NCAL strongly support Reps. Joe Courtney (D-CT) and Tom Latham (R-IA), along with Sen. Sherrod Brown (D-OH) in the legislation they introduced, The Improving Access to Medicare Coverage Act of 2013, which seeks to count all hospital days spent in observation towards the three-day stay requirement. The association also continues to support the Creating Access to Rehabilitation for Every Senior (CARES) Act of 2013, introduced by Rep. Jim Renacci (R-OH), and the Fairness for Beneficiaries Act of 2013, introduced by Rep. Jim McDermott (D-WA). The Consumer Product Safety Commission (CPSC) advises that Lithonia Lighting has recalled emergency lights due to a fire hazard. These emergency light fixtures may be used in nursing centers and assisted living centers. The link for the recall information provides a photograph of the fixtures as well as describing the potential danger and remedy. According to the notice, this recall involves the Quantum® series ELM and ELM2 emergency light fixtures and consumers should contact Lithonia Lighting to receive detailed instructions on how to locate the circuit board and series name and to order a free repair kit, which includes a new circuit board. INTERACT (Interventions to Reduce Acute Care Transfers) is a quality improvement program that focuses on the management of acute change in resident condition. It includes clinical and educational tools and strategies for use in every day practice in long-term care centers. INTERACT is designed to improve the early identification, assessment, documentation, and communication about changes in the status of residents. The goal of INTERACT is to improve care and reduce the frequency of potentially avoidable transfers to the acute hospital. Hospital readmissions not only have the potential for negative physical, emotional and psychological impacts on individuals in skilled nursing care, but also cost the Medicare program billions of dollars. The issue has become a top priority for CMS and managed care programs over the past several years. Rehospitalization rates will be linked to SNF payments in the near future. Don’t delay efforts to actively work on improving practices that prevent rehospitalizations and developing systems to sustain improvement. To learn more about the AHCA/NCAL Quality Initiative goal to safely reduce hospital readmissions within 30 days during a SNF stay by 15% by March 2015. The Clinical Considerations of Antipsychotic Management Toolkit is a clinically-focused resource containing steps and objectives framed around the Nursing Process to assist efforts in reducing the off-label use of antipsychotic medications. The Nursing Process steps include: recognition/assessment, diagnosis/clinical judgment, outcomes planning, implementation, and evaluation. The Nursing Process is a universally acknowledged method used to identify and address complex issues and is consistent with standard problem-solving and quality improvement. There are two additional steps, leadership and staff training, added to the Nursing Process model completing the framework for this toolkit. Each step and objective includes expectations to meet those objectives along with identification of various tools and resources to assist with meeting the objectives. In addition, the toolkit contains a sample policy, sample memo for communication to physicians, medication tapering checklist, SBAR, CHAT, QA review tool and a case study. Per the Centers for Medicare and Medicaid Services (CMS), certain Healthcare Common Procedure Coding System (HCPCS) codes were not included in the 2014 annual update to the Skilled Nursing Facility (SNF) consolidated billing code editing lists. A correction to the coding lists will be implemented in October, 2014. The affected HCPCS codes for practitioner billing are Q2050 and the professional component of G0461 and G0462. The affected code for institutional provider billing is Q2050. If you have claims that have been erroneously denied, you should contact your Medicare Administrative Contractor to have the claims re-opened and re-processed. Yesterday, the American Health Care Association and National Center for Assisted Living (AHCA/NCAL) announced Ed McMahon, Ph.D., as the 2014 recipient of the Mary K. Ousley Champion of Quality Award. Dr. McMahon is being recognized for his contributions to quality in the long term and post-acute care community. For more than 30 years, Dr. McMahon has worked to increase awareness and understanding of the importance of delivering quality care. His contributions on a national level include developing innovative Alzheimer’s care models that have been replicated throughout the country. As Vice President of Quality for Sunrise Senior Living, he has led nearly 300 centers nationwide through the principles of Quality Assurance and Performance Improvement (QAPI). Over the years, he has participated in more than 15 research projects with multiple universities with a focus on improving quality of life, quality of care, and quality outcomes for Alzheimer’s and dementia patients, and is a nationally recognized speaker on quality issues. The Agency for Healthcare Research and Quality (AHRQ) and The Joint Commission have launched a new e-learning module to reduce long term care infections using high reliability industry principles. The new 50-minute e-learning tool can help assisted living and nursing home staff at all levels prevent healthcare-associated infections. The online module teaches long-term care facilities to apply these principles to prevent infections and achieve high safety performance over extended periods of time. The Joint Commission developed the e-learning module with partial funding from AHRQ. It features quizzes and a searchable database of practical resources. The free CDs and online format are available to all facilities, not only Joint Commission customers. Starting on Grandparent’s Day, September 7th and continuing through September 13th, assisted living providers, caregivers, residents, family members and members of community from all across the U.S. will celebrate National Assisted Living Week®. 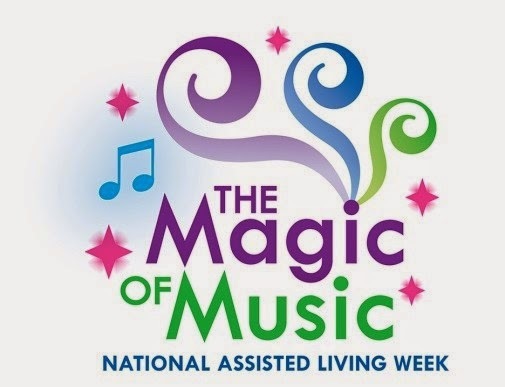 This year’s theme is “the Magic of Music,” showcasing the integral role that music plays in assisted living residences every day. The transformational effect of music continues as individuals age and can provide joy, comfort and in some cases, memories long ago experience. With almost 40% of assisted living residents living with some form of dementia (including Alzheimer’s), looking for non-pharmacological ways to improve the lives of these individuals is a crucial part of providing person-centered care. NCAL’s Quality Initiative includes a three-year goal to reduce the off-label use of antipsychotic medications by 15% by March 2015. NCAL provides a number of resources for assisted living providers to focus on this goal and to educate residents and families about antipsychotic medications. New research and programs, such as the Music & Memory program (as featured in a new documentary Alive Inside) give new hope as to what we as providers can do to improve the lives of those living with dementia. Music also has the ability to bring people together – something assisted living communities pride themselves on. NALW will serve as a catalyst to do just that. And throughout the week, we can honor the individuals residing in assisted living, the staff members who provide extraordinary care day in and day out, and help members of community understand the contributions assisted living provides. NCAL has a planning guide for providers to serve as inspiration for what activities to put together for NALW. NCAL also invites you to “like” NALW on Facebook, to share your ideas and your moments with your residents. The NALW website also has sample documents (letters to the editor, press release, proclamation) and the NALW logo available for you to download. Please visit www.nalw.org for those additional resources. Be sure to also gear up for NALW! The AHCA/NCAL bookstore has all the items you need to display the spirit of the “Magic of Music” in your community. Forty three Senators and an increasing number of House members are urging the Department of Veteran Affairs (VA) to release a final “provider agreement” rule that would increase access to skilled nursing for the nation’s veterans. The rule, originally proposed in February 2013, removes complex and costly federal contracting requirements for providers who currently have VA patients and has yet to be released in final form. It is long-standing policy that Medicare (Parts A and B) or Medicaid providers are not considered to be federal contractors. Federal contracts have deterred providers, particularly smaller ones, from VA participation because of extensive reporting requirements to the Department of Labor on the demographics of contractor employees and applicants. A bipartisan letter is still in circulation in the House and is expected to be released next month. If you know or are represented by a Member of the House of Representatives who you believe would be interested in signing this letter, please contact Dana Halvorson (dhalvorson@ahca.org) or Drew Thies (dthies@ahca.org). In its second year of operations, the US Department of Health and Human Services (HHS), Centers for Medicare & Medicaid Services (CMS) has applied the state-of-the-art Fraud Prevention System (FPS), that employs advanced predictive analytics, and identified or prevented more than $210 million in improper Medicare fee-for-service payments, according to a recent report sent to Congress. By way of background, the Small Business Jobs Act of 2010 (Act) requires OIG to certify actual and projected savings with respect to improper payments recovered and avoided as relating to the use of the FPS for each of its first 3 implementation years. The FPS is part of CMS’ comprehensive program integrity strategy, and has led the federal government to recover $19.2 billion in fraud recoveries over the last five years. The FPS uses predictive algorithms and other sophisticated analytics to analyze billing patterns against every Medicare fee-for-service claim. It has the capability to stop payment of certain improper claims, without human intervention, by communicating a denial message to the claims payment system. The system also uses other data sources including compromised Medicare identification numbers and complaints made through 1-800-MEDICARE. CMS expects to expand the use of the FPS beyond the initial focus of identifying potential fraud into the areas of waste and abuse, which will increase future savings. CMS also has pilot projects underway evaluating the expansion of the program to Medicare Administrative Contractors for early intervention. To obtain the CMS press release and entire report go to http://www.stopmedicarefraud.gov/fraud-rtc06242014.pdf. The US Department of Health and Human Services, Office of Inspector General (OIG), has released a report certifying that the HHS’ use of the Fraud Prevention System (FPS) has resulted in $54.2 million in actual and projected savings to the Medicare fee-for-service program and a return on investment of $1.34 for every dollar spent on the FPS. The report also certifies that FPS identified $210.7 million in unadjusted savings. Further, the report finds that on-going use of the FPS will strengthen the government’s efforts to prevent fraud, waste, and abuse in the Medicare fee-for-service program. HHS’ use of the FPS generated a positive return on investment, and as the department continues to refine its fraud detection models using its governance process and applicable OIG recommendations, it will increase savings. However, the report also indicates that although HHS has made significant progress in addressing the challenges of measuring actual and projected savings, its procedures were not always sufficient to ensure that its contractors provided and maintained reliable data to always support FPS savings. 2) requiring contractors to maintain documentation to support how FPS information contributes to an administrative action. To obtain a complete copy of the OIG report go to http://go.usa.gov/9ECB. With fewer than six scheduled weeks of legislative work scheduled between now and the general election on November 4th, both the House and Senate are slowing down action on Capitol Hill and devoting their focus to campaigning. Primary elections and political campaigns have come to dominate headlines and airwaves both in Washington and in the states despite some contentious fights over appropriations legislation. Members of Congress are hoping to wrap up business in the Capitol as quickly as possible and return to their home districts. The campaigning has already begun to directly affect legislation’s fate in the chambers. A once bipartisan bill to increase hunting and fishing access on federal land died in the Senate last week after accusations that Senate Majority Leader Harry Reid (D-NV) closed off the amendment process to protect the bill’s vulnerable Democratic sponsor, Sen. Kay Hagan (D-NC). Hagan’s race is listed as a “toss-up” and the bill was largely seen as a boon to more conservative voters in North Carolina. There is little chance that the elections will sway the balance of the House, which the Republicans control by a safe margin, but control of the Senate is still largely a coin flip. With some Democrats still polling competitively in more conservative states, Democratic leadership seems content to allow the budget fights to be postponed until after the election, and Republicans might follow suit. Legislators on both sides are trying to avoid the spats that can turn voters against them. Tome Cole (R-OK), a senior member of the House, remarked that “[Speaker of the House] John Boehner (R-OH) and his leadership are taking all the sharp objects out of the room so we can’t hurt ourselves” ahead of the November elections. Both Chambers are scheduled to recess for the entirety of August, a yearly routine that allows them extended time in their home states, as well as most of October, when campaigns will be in full-swing. The early bird registration for the 65th Annual AHCA/NCAL Convention & Expo ends this Friday, July 18. If you haven't registered for this year's event, don't wait any longer. Register before the deadline ends and get the maximum discounts available. Join AHCA/NCAL and thousands of long term and post-acute care professionals in the nation's Capital. This year's event will be held at the Gaylord Resort & Convention Center, across the banks of the Potomac River at National Harbor. 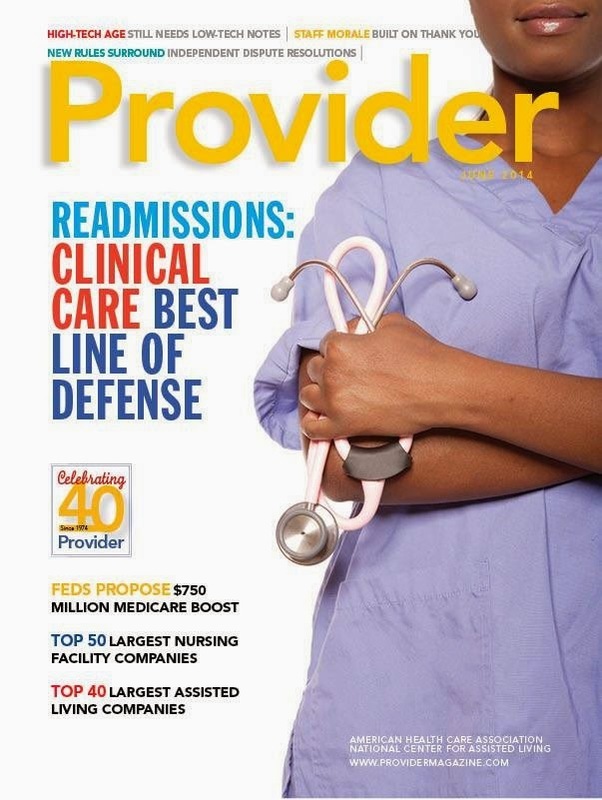 After 40 years of publishing, we think it’s about time to give the readers a little more say in what they see in the pages of Provider magazine. In other words, we want you to write your own stories about your own experiences in long term and post-acute care. Our first-ever crowdsourced issue of the magazine, which we are calling By You, For You, will be published this December, and we want you—the readers—to get the latest in what’s happening on the ground and in the trenches of this field we love. You will hear more from us in the coming weeks and months, so please stay tuned, and think about what you will write for us! The confluence of new technological innovations, higher-acuity residents, and increasing attention from REITs makes assisted living a popular sector these days, and Contributing Editor Kathleen Lourde has the story. Some providers are making quality indicators a priority as the potential to partner with ACOs becomes more of a reality. Lourde also examines some innovative approaches to helping residents stay in their assisted living settings for as long as possible, while a handful of REITs are making assisted living investments a priority. This month’s feature story outlines new guidelines issued for the design of person-centered health care facilities. Architect Jane Rohde describes how the guidelines work and the purpose, as well as importance, of their contents. Caregiving fatigue is real, and its impact on caregivers needs attention, according to this month’s Human Resources column. Author Susan Reese says that work-hour patterns and varied combinations of weekdays and shifts contribute to fatigue for caregivers, which can lead to exhaustion, absenteeism, and, eventually, higher turnover. Electronic health records are not new, of course, but implementing them in long term and post-acute care settings can be a bit of a chore. In this month’s Technology in Health Care, OnShift President and CEO Aric Agmon describes the three steps to getting EHR implementation right the first time. The management of chronic obstructive pulmonary disease (COPD) is the topic of this month’s Focus On Caregiving. Authors John Walsh and Byron Thomashow, MD, walk through the diagnosis and treatment of this crippling disease in the long term care setting. As reported previously, the 2014 release of the Program for Evaluating Payment Patterns Electronic Report (PEPPER) for skilled nursing facilities (SNFs) has been available for download through the secure access page at http://PEPPERresources.org since May 5, 2014. As of June 30th, however, only 7,363 (49%) of the 14,961 SNF PEPPERs have been accessed. By way of background, PEPPER is an educational tool that summarizes provider-specific data statistics for Medicare services that may be at risk for improper payments. Providers can use the data to support internal auditing and monitoring activities. AHCA encourages all its members to obtain the report and evaluate and compare its contents to the data from 2013. To obtain more information go to http://PEPPERresources.org for facility-specific data, user’s guides, recorded web-based training sessions and sample PEPPERs. Individuals and entities that have been reinstated to the federal health care programs are not included in this file. The updated files are posted on OIG’s website at: http://www.oig.hhs.gov/exclusions/exclusions_list.asp, and health care providers have an “affirmative duty” to check to ensure that excluded individuals are not working in their facilities or face significant fines. The US General Accounting Office (GAO), has released a report, Medicare Fraud: Further Actions Needed to Address Fraud, Waste and Abuse, concluding that although the Centers for Medicare & Medicaid Services (CMS) has made progress in implementing key strategies to protect the Medicare program from fraud and abuse, there are important actions that CMS must still implement. Areas where CMS needs to continue its work include provider and supplier enrollment, prepayment and post payment claims review, and identify and address vulnerabilities. Although CMS has implemented actions to strengthen provider and supplier enrollment that addresses past weaknesses identified by GAO; it could further strengthen enrollment screening by issuing a rule to require additional provider and supplier disclosures of information. GAO also has encouraged CMS to increase its use of prepayment edits to help prevent improper Medicare payments up front. To date, CMS has yet to implement past GAO recommendations encouraging CMS for better oversight of the information systems that analysts use to identify claims for post-payment review and the contractors responsible for these reviews. Lastly, CMS’ mechanisms and processes continue to show vulnerabilities that could lead to improper payments. For example, GAO has made multiple recommendations to CMS to remove Social Security numbers from beneficiaries’ Medicare cards to help prevent identify theft, but CMS has yet to proceed with the changes. To obtain a complete copy of the GAO report go to http://www.gao.gov/assets/670/664381.pdf. The US Department of Justice (DOJ) and the Department of Health and Human Services (HHS) have just released the Elder Justice Roadmap (Roadmap), which describes the government’s top five priorities (i.e., awareness, brain health, caregiving, economics and resources), for understanding and reducing elder abuse in this country. The Roadmap was developed by obtaining information and expertise from hundreds of public and private stakeholders from across the country during summits. The goal of those summits was to identify the most critical priorities and concrete opportunities for greater public and private investment and engagement in elder abuse issues. a primer on domestic violence and sexual assault. The training will eventually expand to include six one-hour modules covering issues relevant to attorneys who may encounter elder abuse victims in the course of their practice. HHS also is supporting this effort by developing a voluntary national adult protective services (APS) data system, which will better inform the development of improved, more targeted policy and programmatic interventions. To obtain the Roadmap and accompanying materials go to http://ncea.acl.gov/Library/Gov_Report/index.aspx. As noted previously, on February 12, 2014, President Obama signed Executive Order 13658, Establishing a Minimum Wage for Contractors. The Executive Order raises the hourly minimum wage paid by contractors to workers performing on covered Federal contracts to: (i) $10.10 per hour, beginning January 1, 2015; and (ii) beginning January 1, 2016, and annually thereafter, an amount determined by the Secretary of the Department of Labor (DoL) in accordance with the Order. On June 17, 2014, DoL released the proposed rule that establishes standards and procedures for implementing and enforcing the minimum wage protections of Executive Order 13658. The proposed rule incorporates existing definitions, procedures, remedies, and enforcement processes under the Fair Labor Standards Act, the Service Contract Act, and the Davis-Bacon Act. AHCA has submitted comments to the DoL relating to the VA provider agreements and wage increase. Specifically, AHCA is seeking clarification that the Veterans Administration (VA) provider agreements are exempted from the requirements of the DoL proposed rule. AHCA is also asking that if the VA provider agreement 2013 proposed rule, Use of Medicare Procedures to Enter Into Provider Agreements for Extended Care Services, is not finalized and released before the end of this year, that DoL consider exempting nursing facilities (NFs) from the Department’s proposed rule until such time that the VA proposed rule is finalized. This would thereby exempt NFs with VA contracts from the DoL requirements on establishing a minimum wage for contractors. If you have any questions relating to this matter, please contact AHCA’s Dana Halvorson or Dianne De La Mare. The “Medicare Overpayment Collection Process” Fact Sheet (ICN 006379) was revised and is now available in downloadable format. This fact sheet is designed to provide education on the collection of Medicare provider and supplier overpayments. It includes the definition of an overpayment, an overview of the overpayment collection process, timeframes for the debt collection process for provider overpayments, and additional resources. MLN Matters® Special Edition Article #SE1419, “Medicare Signature Requirements - Educational Resources for Health Care Professionals” has been released and is now available in downloadable format. This article is designed to provide education on the availability of resources related to signature requirements for Medicare-covered services. It includes a variety of educational products along with a brief description, and additional information. On July 3, CMS issued a proposed rule that would update payment policies and payment rates for services furnished under the Medicare Physician Fee Schedule (PFS) on or after January 1, 2015. CMS is proposing a new process for establishing PFS payment rates that will be more transparent and allow for greater public input prior to payment rates being set. Under the new process, payment changes will go through notice and comment rulemaking before being adopted beginning for 2016. The proposed rule does not include proposals or announcements on the PFS update or SGR as these calculations are determined under a prescribed statutory formula that cannot be changed by CMS. The final figures are announced in the final rule in November. The Protecting Access to Medicare Act (PAMA) of 2014 provides for a zero percent PFS update for services furnished between January 1, 2015 and March 31, 2015. In March (prior to the enactment of the PAMA), CMS estimated that the PFS update for CY 2015 would be -20.9 percent. In most prior years, Congress has taken action to avert a large reduction in PFS rates before it went into effect. The Administration supports legislation to permanently change SGR to provide more stability for Medicare beneficiaries and providers while promoting efficient, high quality care. Members that have questions about the proposed rule or have suggestions for AHCA to consider as we prepare our comments may submit them to Dan Ciolek. Each year, AHCA/NCAL recognizes the men and women who give freely of themselves in caring for individuals in long term and post-acute care centers, ID/DD residences, as well as assisted living communities. This year’s award Honorees demonstrate a model of behavior that is selfless, compassionate, and enhances the lives of the elderly and individuals with intellectual or developmental disabilities in their communities. Alicia Durham, Eureka, CA, who volunteers at Butler Valley Inc., Carole Sund Center. • Not for Profit Program of the Year: Benedict Court, Dickinson, ND. • Volunteer of the Year/ Adult: Ruth-Ann Harrod, Wesley, ME, who volunteers at Maine Veterans’ Home-Machias. • Volunteer of the Year/ Group: Amory High School Health Cluster Class, Amory, MS, which volunteers at Golden Living Center Amory. • Volunteer of the Year/ Young Adult: Bailey Combs, Amburgey, KY, who volunteers at Knott County Health & Rehabilitation Center. The ID/DD Hero of the Year award recognizes an individual who works or volunteers in an ICF/IID facility or HCBS Waiver Homes and has shown commitment and dedication to serving people with intellectual and/or developmental disabilities. The Not for Profit Program of the Year award highlights a specific program that adds value to the care of individuals within that community. 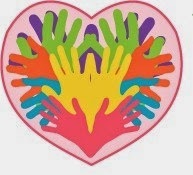 The Volunteer of the Year program seeks to honor one young adult (13-19 years old), one adult, and one group organization that have served in a volunteer capacity for more than one year and have made a positive contribution to a facility, staff, and residents. Each award recipient will be honored at the AHCA/NCAL 65th Annual Convention near Washington, D.C. on October 8, 2014. In the nursing center where I worked for many years, families and visitors would often exclaim with surprising delight, “Wow! It’s as if you speak fluent Alzheimer’s!” What they unknowingly were describing was the phenomenal ability of a gifted team who genuinely could read a situation and anticipate the needs of residents. Speaking fluent Alzheimer’s is a type of intuition. It allows for staff to be deeply in the moment rather than hovering above it, trying to manage it. Staff understand the language (even if the words don’t make sense) and gestures, the moods and the ethos. Virginia Bell and David Troxel authors of the The Best Friends Approach to Alzheimer’s Care would go on to describe the phenomenon as “having knack”. You can spot it when you see it! Staff devote themselves entirely to caring and watching and responding. They become part of the unit or program and recognize the subtlest needs. They are profoundly aware and active in creating a positive and empowering environment for the folks whose lives are connected to theirs. A good example that took place occurred when a gentleman named John came to be part of our program. John was tall and lean, walked miles a day and was described by his wife as having a great appetite. But, try as we might, we were unable to get him to eat. Over the course of several days we tried every variety of food, worked with his wife to find favorites, and because of our unique program, tried a number of delivery styles. By day three we were starting to become really concerned. After another failed attempt we invited John out for a ride with other residents to a beach not far from our center. We watched the waves roll in while chomping blissfully on dough boys. John had five! Speaking fluent Alzheimer’s meant that we had to analyze the situation and figure out what was going on that made John eat here and not back at the ranch. During a lull in the action, one of the staff talked with John and through a series of hilarious responses, we came to realize that John’s wife had taken his wallet. Because he couldn’t pay for his food, he would not eat and he was too embarrassed to share this. Being in a small group (and being ravenously hungry) brought his defenses down. That is not entirely the “fluent Alzheimer’s” part of the story though. Staff hurriedly got to work to respond. His wife was called and immediately asked for his wallet; our social worker dropped by for a “business meeting” to offer John reassurance that all was paid; the rec therapy team created “checks” complete with name and address, routing numbers and a signature line. The checks were delivered to John in a box. The checks were registered in his care plan as an intervention that would enhance his well-being and sense of security. John would go on to eat well. Staff would leave a bill at the end of the meal and John would write a check. Sometimes . . . . we even got a tip! How do you get your staff to “speak fluent Alzheimer’s”? Some already have it. Some need direction and can gain it, some never will. In an effort to capture some of this and identify the skills, knowledge and attitude that staff need in order to become fluent, AHCA created a guide that can be a big help. A Guide to Reducing Antipsychotic Drugs While Enhancing Care for Persons with Dementia - A Competency Based Approach. It can be used in a variety of different ways, but key to its use is the opportunity to view the necessary actions from a competency-based perspective. To manage antipsychotic use, AHCA has identified the competencies that staff would exhibit in their daily work. 1. Antipsychotic drugs are frequently overused in people with dementia. Frequently centers that have not developed the knack of speaking fluent Alzheimer’s rely on drugs to solve their problems. 2. These drugs are not as effective as believed and put people with dementia at risk. Studies show they are more likely to fall, have fractures, develop urinary incontinence, have an unsteady gait and are at higher risk for strokes and increased risk of death. This goes against the effort to create a positive and empowering environment . 3. Many behaviors that caregivers find challenging in people living with dementia are natural responses to situations or perceptions and do not require a medication. Skilled staffs can respond to the needs of the person living with dementia in ways that minimize challenging behavioral responses. Take a look at the Guide; give it to your QAPI team. Talk with staff and see if they speak fluent Alzheimer’s. If not, download the Rosetta Stone of Alzheimer's. The Small Business Administration, the Department of Health Human and Services, and the Small Business Majority have teamed up for a free weekly webinar series where small employers can learn the basics of the Affordable Care Act (ACA) and what it means for their organization and employees. Topics covered include cost containment, the Small Business Health Care Tax Credit, the new Health Insurance Marketplace, and Employer Shared Responsibility. Webinar content will generally be the same each week. Click here for the registration links for upcoming webinars. In addition, Spanish-language webinars are also available. If you have any questions relating to the ACA, please submit them to insurancecoverage@ahca.org, and be sure to check out AHCA/NCAL’s ACA website. AHCA/NCAL 65th Annual Convention & Expo ends next Friday, July 18. Don’t wait—register today and get the maximum discount available. Join thousands of long term and post-acute care professionals at National Harbor on the banks of the Potomac River, just outside Washington, D.C., October 5-8. The AHCA/NCAL Convention & Expo offers more than 60 education sessions with top-rated speakers from the field and from academia, special constituency events for targeted learning, plenty of networking opportunities, and one of the largest Expos supporting your special business needs. Our keynote speakers this year include General Colin L. Powell, U.S.A. (Ret. ), and Captain Richard Phillips. The opening keynote speaker is sponsored by McKesson. Pat Benatar and Neil "Spyder" Giraldo will headline the Gala Dinner & Show! Enjoy all this as well as access to the historic surroundings of our nation’s capital. Visit the official Convention & Expo website for a complete schedule of events, registration, tours, and all the information you need to make the most of your convention experience. The early bird deadline is just days away so complete your registration now and save. The Office of Medicare Hearings and Appeals* has just announced a new pilot, Settlement Conference Facilitation, which it hopes will alleviate some of the significant backlog of Medicare Part B claims being appealed to the Administrative Law Judge (ALJ) level. Settlement Conference Facilitation is an alternate dispute resolution process, designed to bring providers and CMS together to negotiate and settle some Medicare Part B disputes (e.g., only those appeals of Medicare Part B Qualified Independent Contractor-QIC disputes) with the help of a settlement conference facilitator. The facilitator will be an employee of the Office of Medicare Hearings and Appeals (OMHA), who will use mediation principles to help the parties come to a “mutually agreeable resolution.” The facilitator will not make official determinations on the merits of the claims; but instead will help all the parties “see the relative strengths and weaknesses of their positions.” If a resolution can be reached, a settlement document will be drafted to reflect the agreement, and the document will be signed by all the parties. As part of the agreement, any provider requests for an ALJ hearing for the claims covered by the settlement will be dismissed. To obtain more information and learn about eligibility and the process to request Settlement Conference Facilitation go to the HHS/OMHA web site at http://www.hhs.gov/omha/settlement_conference_facilitation_pilot.html. For complete information, please read the entire Settlement Conference Facilitation Pilot Fact Sheet and the process flowchart linked to the HHS/OMHA website. *Correction on 7/10/14 OMHA announced the new pilot, NOT CMS. Last week, about 25 NCAL “State Leaders” from around the country flew to Washington, D.C. for leadership training and meetings with their Congressional delegations. The meetings with Members of Congress and their staff focused on the relative value of assisted living communities as a care setting as well as on-going effort to remove the observation stay Medicare access loophole. NCAL advocates visited over 40 offices in all, including many with key Members of Congress on committees of important jurisdiction. The NCAL members also received advice from the NCAL board and Jeff Call on how to become better leaders in their states and champion the voice of assisted living. With Members of Congress returning to their districts during the August recess, many are slated to continue the relationship they built in Washington by participating in community tours and other long term care-related events. 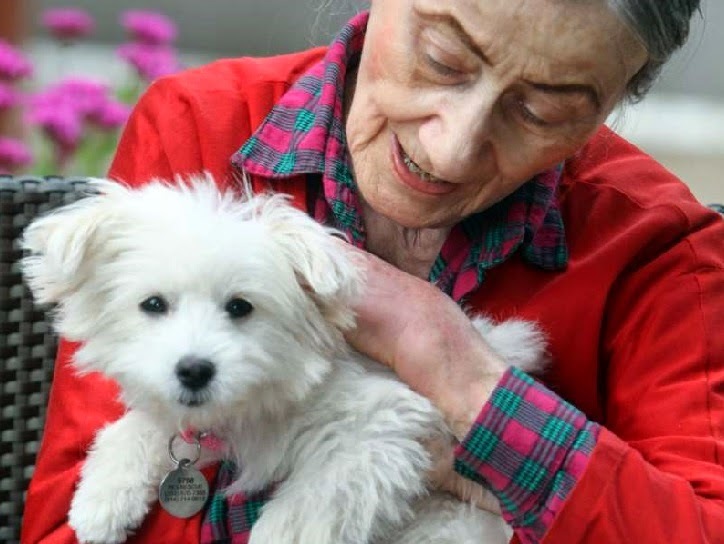 Pets have been visiting nursing facilities and other health care settings for many years. Over time, these visits have made such a difference in the lives of patients that Animal Assisted Therapy (AAT) has evolved to improve a patient’s social, emotional, or cognitive functioning. Animals used in therapy may include a variety of animals including domesticated pets, farm animals and marine mammals. Through the publication of the Caring Canines calendar, the AMDA Foundation sought to document their touching and inspiring personal stories about these examples of animal assisted therapy across the country. The calendar contains photographs and stories selected from the submissions contributed by LTC residents and staff members, pet lovers, and professional photographers through a nationwide campaign. If you wish to submit photos and your stories for the 2015 Caring Canines calendar, please note the deadline is Friday, July 11, 2014. For questions about this 2015 calendar please click here. Or contact Joanne Kaldy at JoKaldyCooper@aol.com or (240) 527.9848. For many years nursing centers around the country used rotating assignments to fill shifts, take care of resident needs, and basically, get the job done using three sets of 8 + hours shifts. We adopted this from our cousin, the hospital, back when it was believed that clinical care should closely mirror the hospital environment. But, as long term care began to develop its own identity and emerge into a unique style of care, the notion of a rotating assignment became a hindrance to the type of uniquely individualized environment that leaders were trying to create. In order to assure that the unique needs of each individual was being met, rotating assignment would have to be reinvented, so that the same care giver could provide consistent, intuitive care on a daily basis. “Intuitive” became the operative condition! By spending time with the resident on a consistent basis, staff could learn the patterns of a resident’s daily life, understand what makes them tick, identify preferences and avoid "discomforts." Staff could be much more able to anticipate residents' needs and enter more deeply into a different type of relationship with the resident. Staff would come to appreciate that, in their new role, they were much more involved in residents' lives, far beyond the daily ADL’s formerly provided. They would go on to become cheerleaders, supporters, secret keepers, motivational coaches, quasi-therapists and family to the residents they served, respected and loved. This one, seemingly innocuous change, in long term care is probably one of the bigger drivers of quality, satisfaction and one of the surest ways to provide individualized care. The two go hand in hand. Recently, AHCA designed a guide, Consistent Assignment: A Resource Guide, to support those who are adopting consistent assignment. It provides easy steps and links to resources that help an organization move through each phase of the process from initiation through adoption. Because so many valuable resources already exist, this guide identifies five steps to adoption and then directs you to resources that many have created to support this important change. Among them are resources from: Advancing Excellence Campaign, Rhode Island QIO and RI State Survey Agency and the Pioneer Network. Among the resources are videos, assessments, and magazine articles all clearly gathered into easy steps. 1. Why switch to consistent assignment? On Friday, The American Health Care Association and the National Center for Assisted Living (AHCA/NCAL) announced the names of the 77 long term and post-acute care centers that have earned a 2014 Silver – Achievement in Quality Award. The award is one of three distinct awards possible through the AHCA/NCAL National Quality Award Program, which honors select centers across the nation that serve as models of excellence in providing high-quality long term care. A full list of the recipients is available on the National Quality Award Program website. AHCA/NCAL announced the recipients of the Bronze – Commitment to Quality Award on May 30th. The names of the coveted Gold- Excellence in Quality Award will be released in August. The recipient centers will be honored during the AHCA/NCAL’s 65th Annual Convention and Exposition, October 5-8, 2014, in Washington, D.C. Implemented by AHCA/NCAL in 1996, the National Quality Award Program is centered on the core values and criteria of the Baldrige Performance Excellence Program. The program assists providers of long term and post-acute care services in achieving their performance excellence goals. For more information about the program, click here.